The nose is the door of the breathing function. Nasal obstruction results in disturbance of one’s difficulty of breathing, headache, insomnia or even other pathological processes. 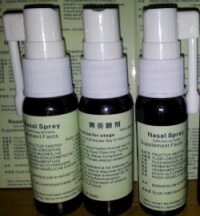 Our Herbal Nasal Spray contains more than 20 kinds of natural herbs, which can reduce and eliminate infection from virus, bacterium inside nose. This product is very high concentrate of natural herbs, it work strongly for pollen allergy, and many others nose problem without side effect. Turn the nasal tube upward. Spray into each nostril. Repeat as many times as needed throughout the day. 4-8 sprays / day is a normal dose for most nasal conditions until symptoms are gone. Suitable for adults, children and safe for pregnant women.